So you've just moved into your Springs luxury apartment home and the last thing you feel like doing is going out to shop for new furniture and accessories. You don't have to go any further than your laptop, tablet or smartphone with these great online home furnishing stores. According to Wayfair, they've got "just what you need," and they just may be right. Shop their extensive inventory of more than eight million items by category, room and style or get "inspiration" with photos from editors and designers. Create Pinterest-style boards to save ideas and share them with others. Orders of more than $49 ship free, while others get a flat-rate fee of only $4.99. Established in 1999, Overstock is the granddaddy of online home furnishing stores. The already low prices are frequently discounted even further, and orders usually ship within one to two days. Worldstock is their "boutique" store featuring fair-trade home furnishings from Afghanistan, Brazil, Zimbabwe and other spots around the globe. Join Club O to receive free shipping on all orders and five percent reward dollars on every purchase. Browsing the Cost Plus website is like strolling through street bazaars in far-off lands. The company dates back to the late 1950s when a San Francisco entrepreneur literally sold imported furniture right off the piers. Today you can still find original but inexpensive items from around the world without traveling to the West Coast. Sign up for their newsletter and get 10 percent off your next purchase. Brad's Deals is not a store per se, but it's like having a personal assistant who does the shopping research for you. Brad's team spends all their time searching the web for the hottest specials on everything from home furnishings to vacation packages. You can also find coupons for big savings from major retailers like Amazon, Best Buy and Home Depot. 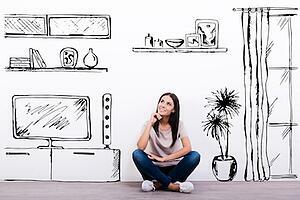 In addition, their experts blog on helpful topics such as "How to Revamp Your Apartment for Less than $50 a Room." Sign up to get each day's top deals delivered to your inbox. Pre-owned furniture is a good way to save money and love the environment, but sites like Craigslist and eBay can be a hassle. Everything but the House (EBTH) takes you to top estate sales across the country. You can search by category if you're looking for a specific type of item. Apartment Therapy Marketplace is an online community where you can buy (and sell!) used furniture from people in your city or across the country. Chairish, created by the co-founders of travel site Hotwire, offers a curated selection of fabulous vintage and used furniture and handles all shipping arrangements. Not satisfied with your purchase? Notify Chairish within two days of delivery that you want to return it. Have you scored a terrific deal on a favorite piece of furniture? Tell us in the comments!